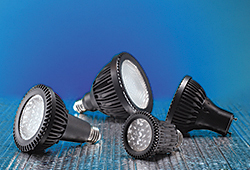 LED bulbs come in various PAR20, PAR30 and PAR38 styles. Operate in either 120VAC dimmable or in a range from 90-290 VAC. Color quality of 3,200K and CRI of 82. Can be installed in existing 26mm Edison/E27 European screw-base sockets or GU24 dual-pin sockets. Produce from 333 to 762 lumens.